Show your most loyal and dedicated team members that you care with thoughtful years of service gifts to commemorate their work for your company. Years of service awards from Successories fit any budget, so you can regularly give out employee years of service awards that keep employees motivated, happy, and productive as they continue to work for your company. Shop a wide variety of years of service awards below, including customizable options for truly unique gifts. Your employees exchange their time for work that helps your organization succeed. This dedication deserves to be recognized on a regular, timely basis. One of the best ways to accomplish this is through implementing a service awards program at your company. Service awards programs show recognition and appreciation for your employees’ commitment to your company as well as their performance. Commemorating work anniversaries is one of the most popular types of service awards programs, as are "Years of Service" awards, which are of a similar sentiment. Through heartfelt recognition shared on days of significant milestones, employees can feel valued and appreciated at their companies, which can then help them experience an increased sense of engagement and loyalty to your company. We se this gift as an milestone bar for employee anniversaries. The bar is added to the crystal award. Employees love the bar and all are displaying it on their desk. Keeping productive employees at your business is vital to sustaining your bottom line. Replacing an employee costs more than 15 percent of their annual salary, and over 200 percent of the annual salary for highly educated executive roles. Companies that have strategic recognition programs, such as planning annual employee years of service awards, report a lower turnover rate than companies that have no such program. Giving years of service awards doesn't have to be a huge investment to pay off significantly for your business. The recipient feels valued. A personalized gift demonstrates to the receiver that your business acknowledges their role within your company, that their work is appreciated, and that you want them to remain with your business because their efforts are valuable. 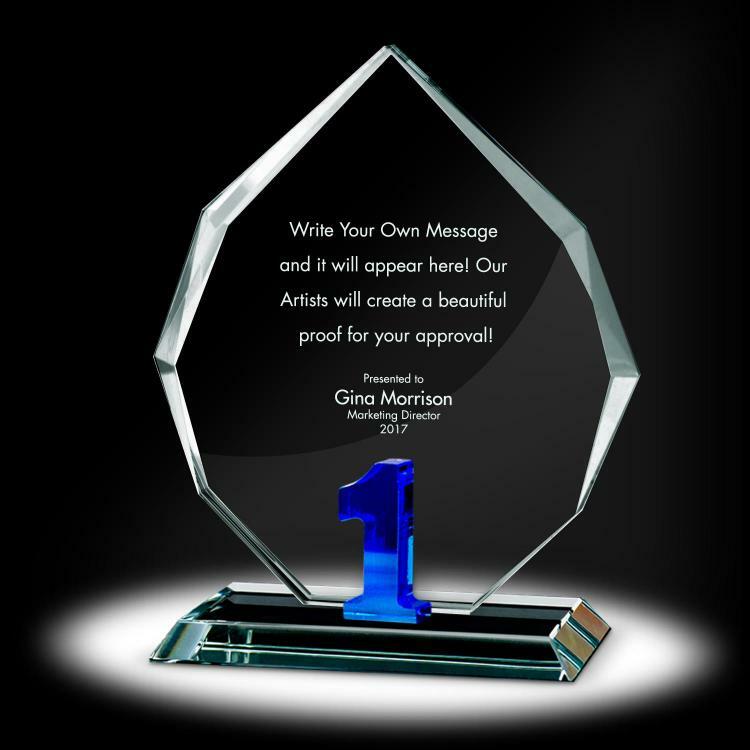 A beautiful trophy-style gift is one a recipient can proudly display in their home or office, and that will remind them of the positive aspects of working for your company whenever they see it. Other team members have something to look forward to. Employee recognition can play a meaningful role in whether or not many top employees stay at your company. Besides conveying to everyone that you appreciate the work of long-term employees, being recognized at a work milestone is an event employees can look forward to and a reason to stay motivated on the job. Years of service awards strengthen relationships. Depending on the circumstances in which you give out years of service awards, the recognition you dole out may alert team members to the contributions their peers are making that they not may have known about. Public recognition ceremonies, or even an email note that accompanies an award, can indicate details of how your most dedicated team members are making a difference at your business. This can increase the respect and appreciation they receive from their peers, which bolsters teamwork within your business. Depending on the amount of time an employee has worked for your company, you can designate certain types of awards based on years served. The most effective recognition is that which is personal, direct, and sincere. As long as those sentiments power the recognition that is given, years of service awards don't have to be expensive to make an impact. Lapel pins: Lapel pins are easy and attractive to wear on the job, or at events outside the office where an employee is representing your company. These badges of honor can be worn proudly and spur interesting conversations, which ultimately help to bolster the perception of your business. Trophy awards: Great for handing out on a stage or at large events, trophy awards are substantial tokens of appreciation that carry literal weight. 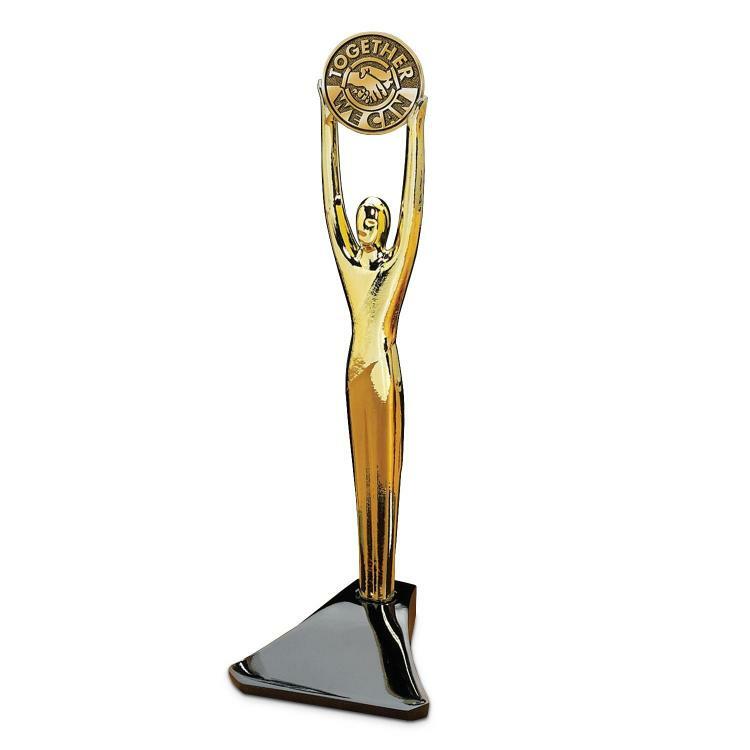 Recipients will love to display these in an office or on a desk, and they're items they'll be proud to show off to co-workers and visitors to your business. 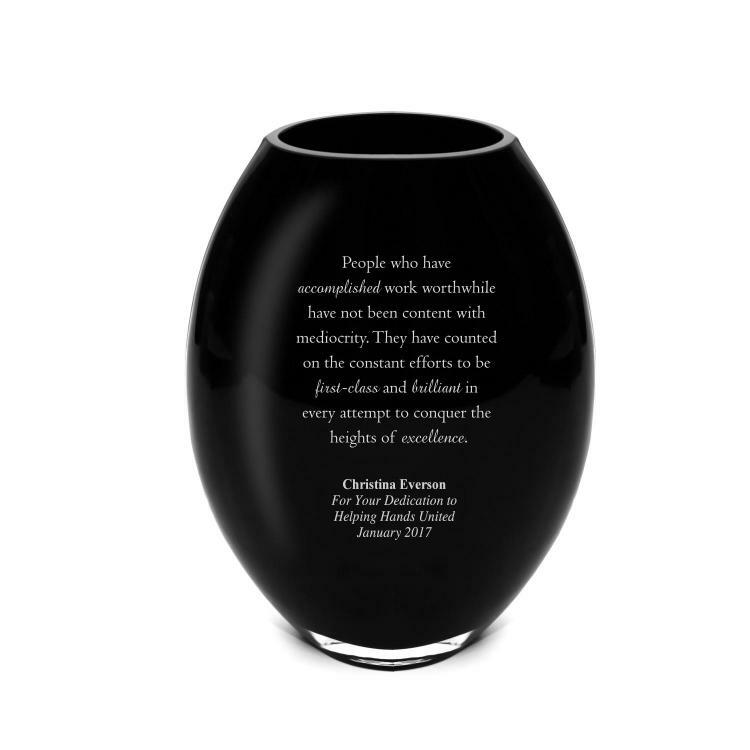 Decorative items: Years of service gifts like beautiful vases offer a personal touch and can be quite useful to recipients, while awards like praise pennants add more personality to an office and give recipients something to look forward to accumulating over the years. You can get creative and make years of service awards more personal by adding a unique message to the gifts. Giving out service awards is a winning solution for engagement company-wide, from improving the dedication of your most valuable employees, to boosting the relationships among teams. 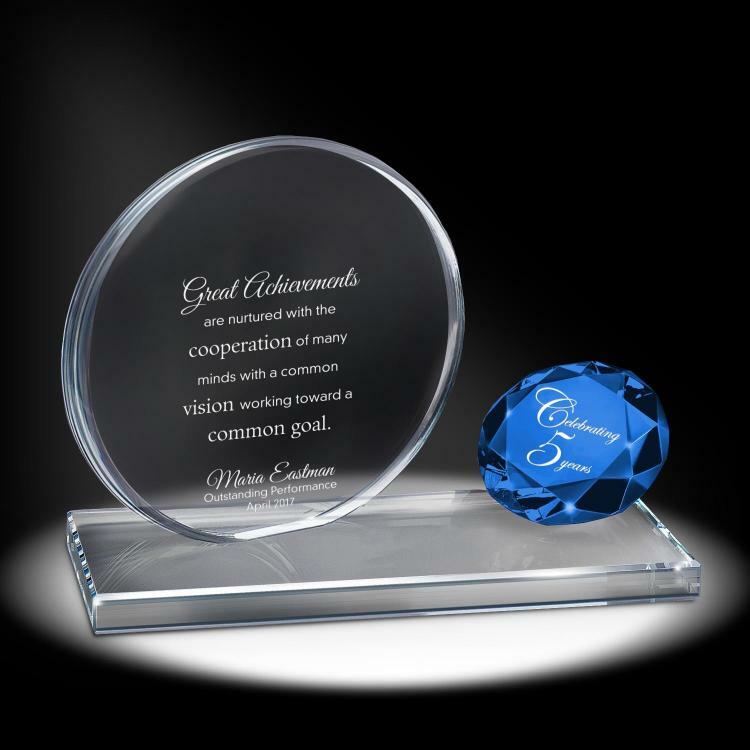 At Successories, we make giving meaningful recognition easy and affordable, with high-quality service awards items your employees will cherish. For whatever occasion in which you want to hand out awards, and for gifts that match the personalities and interests of the recipients, you can always count on a diverse selection of employee years of service awards from Successories. 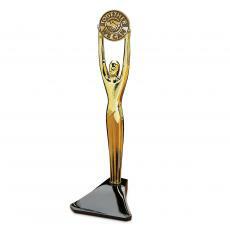 Shop based on your budget, and make years of service awards an integral part of a winning business strategy. Though it's important to recognize employees for the quality of their work, it is also essential to show appreciation for their years of service. As Kim Harrison noted for Cutting Edge PR, "Some may believe that recognizing employees for their time served only emphasizes quantity rather than quality – the chair warmers rather than the achievers. However, the fact is that any significant length of service represents a major investment by an employee from their life. This choice of investment is something to be valued, especially when there is a comparatively high employee 'churn' (and cost of turnover) these days compared with the past." The survey also found that 74 percent of companies say they have some sort of service anniversary program. However, just 22 percent of these companies say their program is excellent, with 31 percent rating it as fair or poor. Though the programs may not be as fully developed as many companies would wish, the intentions are noble. The survey found that the No. 1 reason companies have years of service awards programs to appreciate employees, followed by increasing employee happiness or satisfaction. The results of the survey show that while employers have lofty goals for their service awards programs, the content of them is failing to deliver. In the next sections, let's look at ways companies can strengthen their service awards programs to better suit the expectations of their employees. Service awards programs should receive a portion of the company budget, as the programs are essential to worker productivity and happiness. If you need a guide for how much money to allocate to these efforts, look to the SHRM/Globoforce survey - it found that the most effective recognition programs used more than 1 percent of payroll. Figure out the most that your company can spend on recognition, and aim to have your budget make the most of it. 28 percent celebrate first-year anniversaries. Traditionally, companies will celebrate the major milestones, but it's also important to celebrate smaller anniversaries, especially in today's employment market where individuals stay at companies for shorter periods of time and more frequently hop among jobs, as Inspirus noted. The source recommended that companies with high turnover celebrate "mini-milestones" such as every 90 days, as it helps give a boost to employee engagement levels from the get-go. When successfully implemented, service awards programs can boost employee happiness levels and create a positive, inclusive work environment. When poorly carried out, however, these programs can have the opposite effect, dragging down morale and engagement. This is especially true when it comes to timing. Letting an employee's work anniversary pass without any mention can make the employee feel like he is not valued and produces negative feelings. Instead, be sure to stay organized and on top of employee milestones, approaching years of service markers and other opportunities for recognition. Setting alerts in your HR, intranet or other internal system can help you manage these dates and stay on top of recognition in a timely and organized manner. While service awards programs recognize years of service, to make them the most "inspiring" and effective, the recognition should be tied back to company values. When celebrating an anniversary or other milestone, in your presentation reflect on which company values the employee excels in showing, and all the strides she's made since their last years of service celebration. As the SHRM/Globoforce survey noted, recognition can be even more powerful and resonant when you reward employees for showing a commitment to organizational values. Employees celebrating service milestones shouldn't receive a generic, one-size-fits-all gift. Instead, the item should be customized to the individual. High-end gifts such as crystal clocks, wine cradles and vases make great gifts for individuals celebrating 10, 15 and 20-year anniversaries - these items are treasures that will last a lifetime. For annual work anniversary celebrations, personalized glassware, tech accessories, apparel or plaques work well. Other gifts could be a framed photo or poster that is signed by the employee's co-workers. A heartfelt note can mean the world to someone. According to the Harvard Business Review, OGO found in a survey that 76 percent of people save handwritten thank-you notes. Don't use a template or say the same thing you say on every note - instead, personalize the message to reflect the employee's unique achievements and strengths. Another great gift for service milestones is something that the employee can use or enjoy with his or her family or friends. For example, a gift card to a favorite restaurant. Reserve a meeting room to hold a party for the recognized employee, with food catered. You can put together a presentation about the employee and their accomplishments. For major milestones, you can host the party at a restaurant or function hall. Another great way to celebrate service milestones is through social recognition in the workplace. For example, you could give the employee a shout-out or blurb in the company newsletter or staff magazine, Kim Harrison noted, or write a special post for him on the employee intranet or homepage.